„Even before I read the article describing the event my first thought was that it was really remarkable that this commemoration managed to attract several thousand people while all other demonstrations organized lately by left-liberals were very small. Only a few hundred people took the trouble to raise their voices against intolerance and the visible growth of the far right. And behold, here is this huge crowd. Maybe it means that in the future we will see more vigorous political participation on the part of the left. The march was obviously more than a commemoration of the Holocaust. 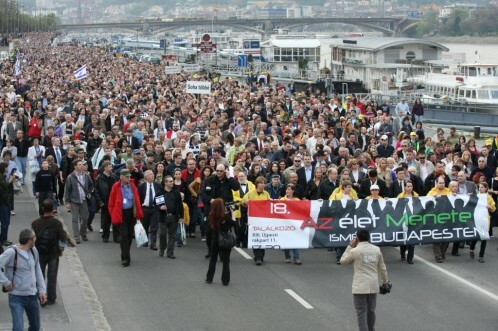 It was also a demonstration against the growing Hungarian Nazi movement– because, let’s face it, it is a Nazi movement although in Hungary most people don’t dare to label it as such. When I wrote an article in Hungarian about the international reaction to Jobbik and mentioned that foreign commentators call them fascists, my editor wrote back expressing her hope that I could footnote that claim because otherwise Jobbik will sue the paper. , and Gábor Iványi, a well known Methodist minister. Apparently several members of the diplomatic corps also took part. I definitely saw the U.S. ambassador. 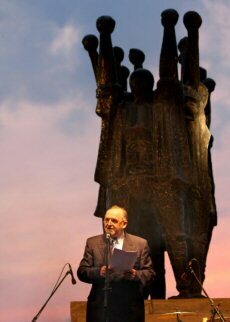 Although there were several speeches the most interesting was the one given by Sándor Németh [foto], head of the Hungarian chapter of the Assembly of God. This church is a very curious phenomenon. One would think that it would be politically conservative, but [they] are a liberally minded lot and the church has long been associated with the liberal party. For instance, ATV, a liberal television station, is owned by the church. I am happy to report good news from Hungary and I am proud to be for many years the Vienna correspondent of “Hetek,” the weekly of “Hit Gyülekezete.” This Budapest paper, whose chief editor is Sándor Németh, takes on every issue a stand against racism and antisemitism and is a staunch advocate for Hungarian-Israeli friendship.